Art books have been around for a long time, and they take on many different styles and formats. Titan Books, in conjunction with Microsoft Studios and 343 Industries, has put together a fantastic addition to any Halo fans’ collection in the form of Awakening: The Art of Halo 4 Enhanced Edition for iOS devices. I am a videogame art nerd, through and through, so I have my fair share of physical and digital artbooks. While receiving a digital artbook along with a game that you have been waiting patiently for is a good bonus, it just doesn’t compare to having a physical copy in your hands. There is something much more personal and engrossing about flipping through a heavy tome of collected artwork, taking your time to pick out the small details strewn about the paintings and reading each small commentary piece to help you get a better understanding of the artist’s mindset. When the opportunity came up to take a closer look at this digital artbook, I was skeptical that it could hold my attention for more than one sitting. I am very happy to state that this was not the case. 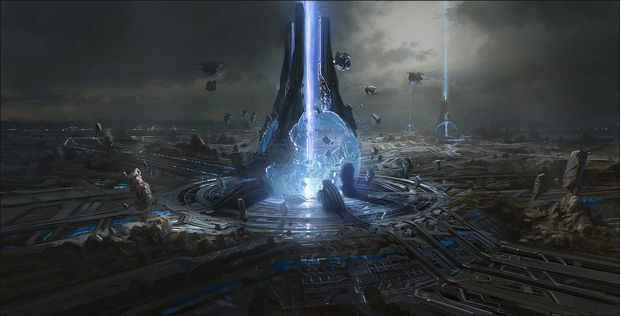 Awakening: The Art of Halo 4 Enhanced Edition includes a pair of unique features found only on the iOS versions: extended galleries and embedded video clips. 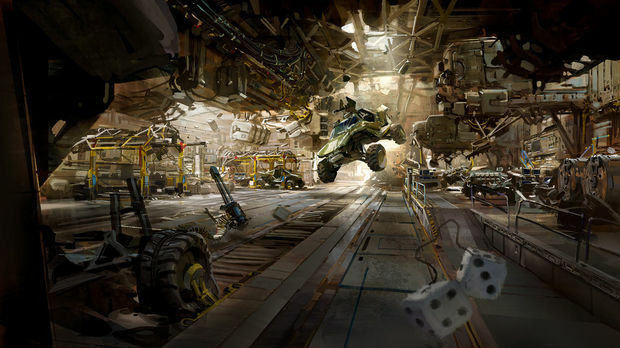 The extended galleries have been added throughout the book showing off unused concepts, different angles of familiar locales and other assets from the finished product. Just like any other eBook, you can zoom in and out of the pages at your desire. The zooming function, at least through the iBook app, is somewhat limited as it won’t allow you get a better look at the really fine details within the page. 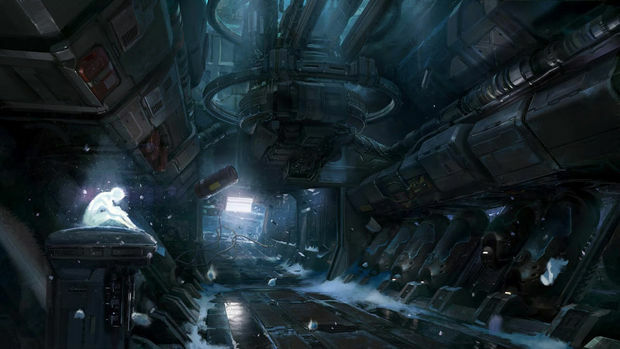 The video segments can be broken up into two different categories: cinematic footage from the final game and interviews with some of 343’s senior artists. These clips play directly from an embedded video player within the page, but they can also be enjoyed at full screen. While the cinematic clips are helpful, as they show off how the final concept implemented in Halo 4, the real stars are the interviews. Getting the chance to hear directly from lead character artist Matt Aldridge on how Cortana’s new design was locked down or hearing John Liberto describe how he made a UNSC vehicle bay feel like it was properly lived in was great. These interview segments add tremendous value to the viewer, as they showcase the artist’s motivations on their work, as well as the overall message that they were trying to convey. Sci-fi design is a tricky business; artists at every level have to make sure to respect the important balance between fantasy and function in their designs. This balance point is important both for the art direction of the game and to create that sense of believability for the player that will help connect themselves to the world presented. 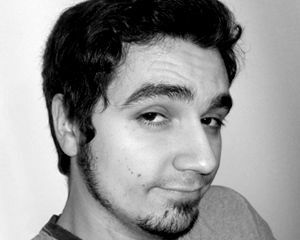 For example, you want to make sure that the weapon you give players has the feeling and look of a futuristic and powerful firearm, but you don’t want to a design that is so far out and foreign that they can’t make connect with it. One way to alleviate this issue it is to reference the look of the familiar weapons of today and incorporate that into your design. 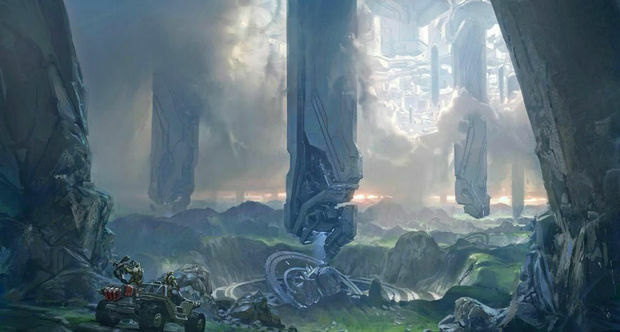 While many other works of fiction have established that going so far into the fantastical in their designs can lead to success, the Halo series has always tried to strike a balance between the two. Nowhere is this most evident than in the environmental design of Requiem and of the USNC Infinity. The detailing added into John Liberto’s work on the interior sections of Requiem really helps give the world a much fuller and solid look. Being able to see the machinery and piping underneath everything shows the viewer that this world has more to it just beneath its surface, rather than just being a few metal plates floating in space. Another highlight of Awakening was the redesign of Master Chief for Halo 4. Lead art director Kenneth Scott speaks frankly on the challenges that he and the art team faced when trying to rework one of the most recognizable icons in the last ten years of gaming. It was also interesting to see the multitude of Spartan armor designs for multiplayer; from the helmets to chest pieces, each suit has a style and feel of its own while still echoing the influences of its progenitor. The book is also a showcase for a wide variety of concept art techniques and principles. One standout video segment features lead concept artist Nicolas “Sparth” Bouvier describing his method of painting over top a render of an untextured level with basic geometry in order to accurately calculate the scenes perspective and help breathe life into scene. Sparth and Thomas Scholes’ unique use of texture brushes throughout their work to create more dynamic energy, with a hint of chaos, is truly something to admire. The placing contrasting elements together into your environment is another great technique used by many artist to draw your attention towards whatever they like. By placing the massive hard-edged and sharp-angled Forerunner structures against the backdrop of the organic and soft-edged terrain of Requiem's surface, the artist is helping to guide your attention towards those Forerunner facilities, while also creating an atmosphere of mystery and curiosity about them. Awakening: The Art of Halo 4 Enhanced Edition is a great addition to any iOS art lover’s library, be they a Halo fan or not. For the very reasonable price point of $9.99, you get more than enough graphic content to justify your purchase, as well as giving you more through the galleries and interviews segments. No matter the technique or canvas used, this book celebrates the hard work, passion, and talent of a very dedicated group of people who set themselves to the task of expanding upon a beloved and rich universe. It’s one thing to create worlds that need to live up to the expectations of your fan base, but it’s another thing entirely to breathe life into those worlds and make them feel believable to everyone.